Forma™ stimulates the formation of new collagen and improves the skin’s elasticity for long-lasting and remarkable results. The device uses temperature controlled heating of the skin to effect skin tightening, smoothing and the reduction of wrinkles. The radio frequency current flows between the electrodes to provide a comfortable thermal experience, without concerns of hot spots or under treatment. Built-in temperature controls allow for the attainment of clinically proven optimal epidermal temperatures. In addition, Forma has the exclusive capacity for prolonged exposure at therapeutic temperatures, which can be reached quickly and uniformly. 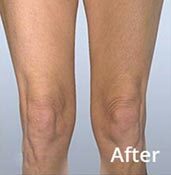 The best results are seen in those patients that have modest loose or inelastic skin, particularly in the jowl, neck, knees or abdomen. Patients with extreme laxity or sagging of the skin are not good candidates for Forma RF. Everyone is a candidate for Forma™, regardless of their age or skin colour. Collagen is a heat sensitive protein. Forma™ slowly heats the collagen in the skin to a sustained temperature of 41°C – 43°C, which is not painful. It uses temperature sensors and feedback controls to keep the temperature of the skin in this precise range. The heat causes the heat-sensitive collagen in the skin to “unwind” and the body responds by making new and better collagen to repair the skin. The result is tighter and better looking skin. There is no downtime from a Forma™ treatment. Each treatment feels like a warm massage. Maintaining the skin’s temperature at a set point of 41°C – 43°C makes the treatment entirely comfortable and results in a 20% increase in collagen for most patients. Forma™ is meant to work slowly over time. A series of gentle treatments are needed to build enough collagen to achieve visible skin tightening and wrinkle reduction. Six weekly or bi-weekly treatments are recommended for best results. No maintenance is required. However, you will continue to age and many patients will elect to have periodic treatments to maintain or improve their appearance. Yes! Forma™ can be combined with other procedures to create a synergistic effect and maximise results. Forma™ can be used with INFINI™ or High Intensity Focused Ultrasound (HIFU) treatments to give best results for skin tightening, reduction of wrinkles and lines.